Inspire your child with Ruth’s loyalty and kindness. 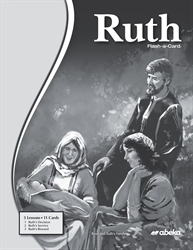 This lesson guide (already included in Ruth Flash-a-Card and Bible Stories) will help you as you teach 3 Bible stories that tell of Ruth’s life from moving with Naomi to meeting her kinsman redeemer. This detailed booklet will give you the content to teach, prompts for when to use the pictures, review questions for each story, and a guide for leading your children to the Lord! Expose your children to the doctrinal truths and applications within the inspiring story of Ruth.